The program module “Timetable” named as TT is one of the basic elements of the database airport. 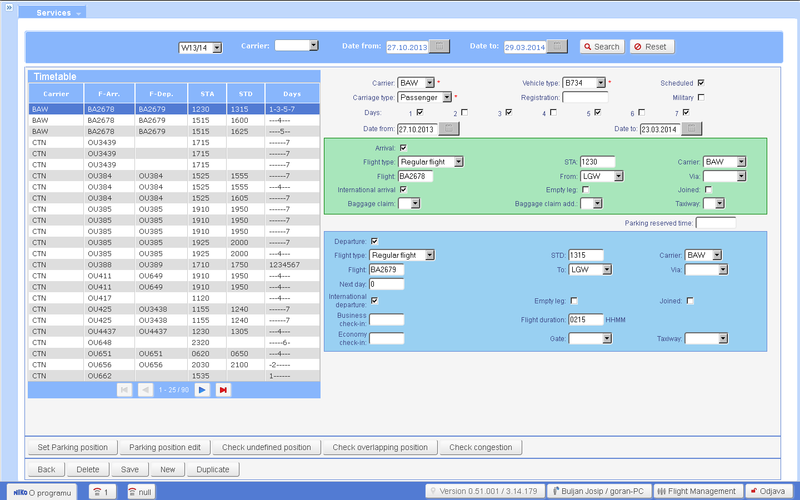 In flight schedule are stored all information about planned flights. Writing data of the flights in advanced specified period, usually for the next half-year season. The timetable will include all flights of all airliners who use the airport. Flights are recorded as a single record for a complete series of flights that are repeated weekly for the entire season or half of theseason. There is posibillity of recording only one anounced flight. Recording the regular flight but other flights that are repeated weekly. These are often announced series of charter flights. The purpose of the flight schedule is automatically populating the schedules for several days in advance. The flight schedule is the basis for the review and planning of resources especially parking positions on the apron, but also other airport resources due to the need to simultaneously servicing multiple aircraft. From the data about the flights of the airport we can make some statistical reports.